Mülheim, March 15, 2016 – Turck has strengthened its claim to be a full range supplier of fluid sensor technology with an extended offering of pressure transmitters: The compact PT series were developed to meet the demanding pressure measuring requirements not only in the machine building sector. Their robust design also allows high-precision wear-free pressure measuring and long term stability even in harsh operating conditions. The entire PT series is UL certified and approved for the Ex area, drinking water applications, and also maritime applications. Customers are provided with the most typical process connections, various types of output signals, as well as ceramic and metal measuring cells, both in the standard measuring ranges -1 to 1,000 bar as well as in the low pressure ranges up to 600 mbar. With this range of variants, Turck offers an optimum solution for monitoring pressures in fluids and gases in many applications. With the development of the new transmitters Turck was not only able to optimize technical features but also the economic efficiency of the sensors. A broad portfolio of standard products in stock, combined with short production times for customized variants, increases availability and reduces inventory costs. 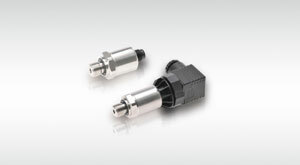 This flexibility enables Turck to respond quickly to changes in market demand and guarantee short delivery times for the PT sensors.